We are proud to say that we received SECOND PLACE in the "commercial category" at the Meridian Firefighter's 11th Annual Chili Cook Off on Saturday! Thank you to everyone who stopped by our booth, tried our award winning chili, and put your tickets in our boot. We couldn't have done it without your support! Our Marketing Department was at the Boise Centre on Thursday evening talking with local business professionals at the Boise Metro Chamber after hours event! Great views, great people, great food, and a great time had by all! 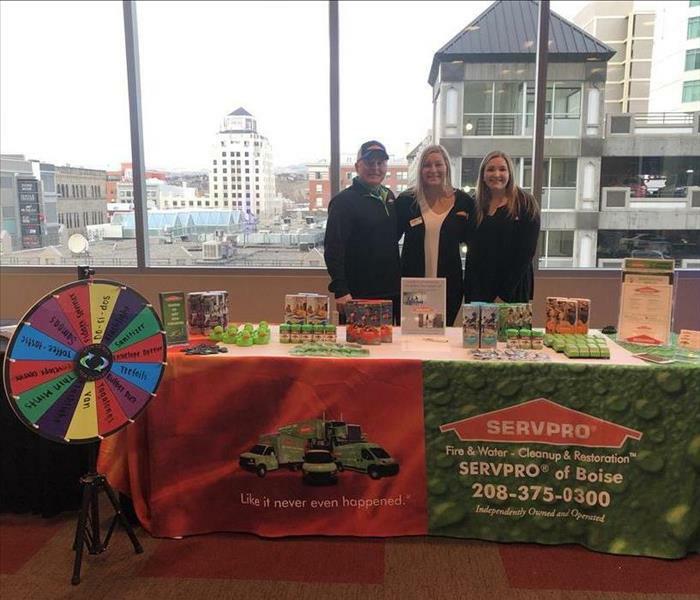 SERVPRO was thrilled to be a sponsor at the BOMA Symposium this year! Thank you to our guests who joined us at the event, we appreciate your business and friendship. Also, thank you to everyone who stopped by our booth to say hello and signed up for a FREE Emergency Ready Plan! We cannot wait to come out to your commercial buildings and help you put a preparedness plan in place! Our Marketing Department had a wonderful time attending the Eagle State of The City, co-hosted by the Eagle Chamber of Commerce. We are proud to be a part of this growing community and excited to see what projects are on the horizon in 2019! Thank you to everyone who stopped by our booth to chat about our services. We truly love being able to educate members of the community about disaster preparedness and restoration/reconstruction. 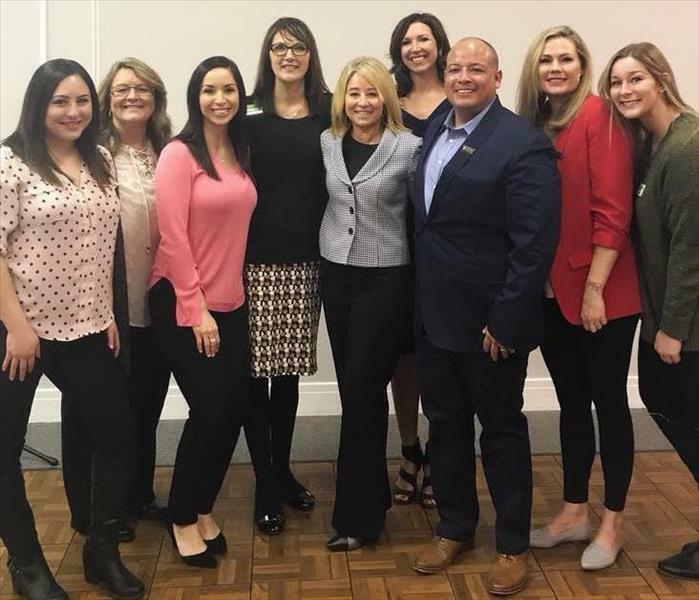 Our very own Jordyn Funk was the Breakfast Sponsor at the January Women's Council of Realtors business meeting! We are so proud of her dedication and commitment to not only our company but the WCR as well, keep up the great work Jordyn! Our team had a wonderful time serving members of the community at the Boise Rescue Mission Ministries 2018 Christmas Banquet! We even ran into Mr. & Mrs. Claus! It was an honor to host Kyle Mikowski from the Meridian Police Department and his family at the Famous Idaho Potato Bowl. We had the pleasure of presenting him with the Honor a Responder Award for his selfless acts of bravery both on and off duty. Thank you for your endless service to our community! We had a blast at the annual Eagle Chamber of Commerce Holiday Party! A huge thank you to Elena Cardwell from Steve Garringer's State Farm Insurance Agency for joining Kaitlin Hummel at the event! 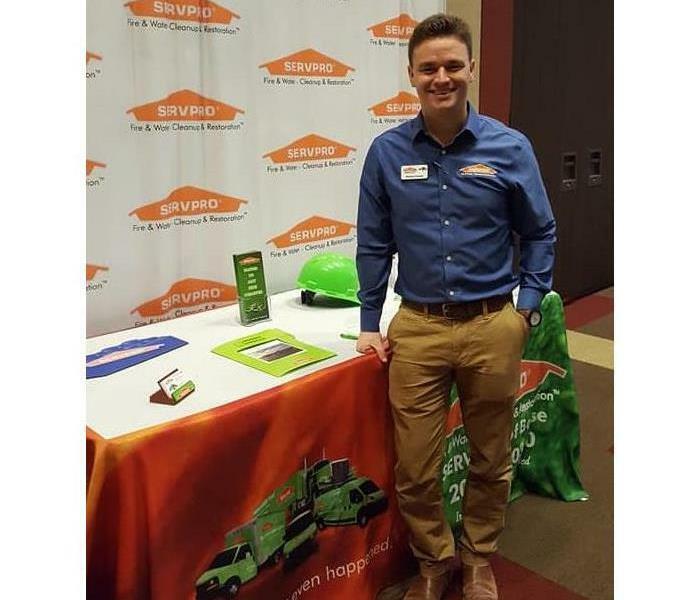 SERVPRO of Boise loves the Chamber! Our team had a blast assisting BOMA Idaho and local business professionals purchase toys for members of the Boys & Girls Clubs of Ada County. We hope all the children have a wonderful Christmas! We had the pleasure of attending the IREM breakfast yesterday with the Hope House Home for Children. If you are looking for a worthy cause to get involved financially or volunteer with, look no further. Donnalee and her husband Ron have given over 50 children a home after failed adoptions or foster care situations. They are truly inspiring! Thank you to Dawn Adams, Farmers Insurance Agency and the Boise Rescue Mission Ministries for hosting another successful Holiday Food Drive! We are honored to be a part of such an amazing event, that continues to reach new heights, set new records and feed thousands of local hungry individuals and families each year! 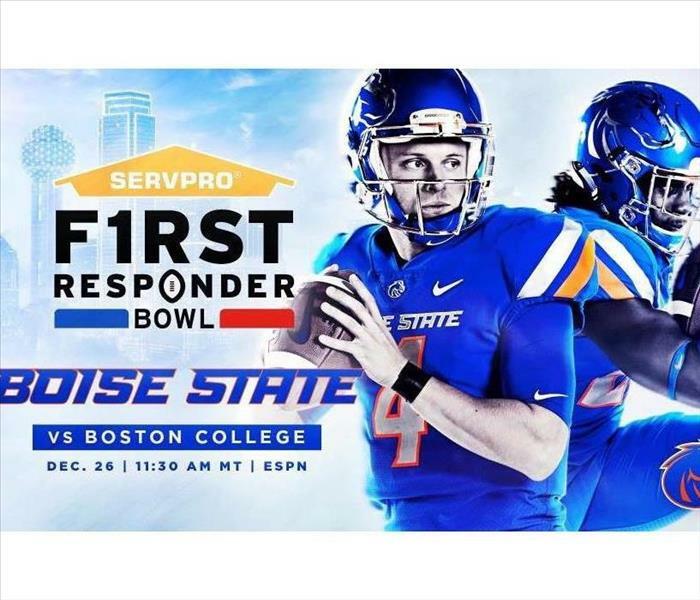 Boise State Football is heading to the Lone Star State for a head to head battle at the first-ever SERVPRO F1rst Responder Bowl. We are thrilled that our home team gets to play in this specific bowl game, congratulations and as always GO BRONCOS! 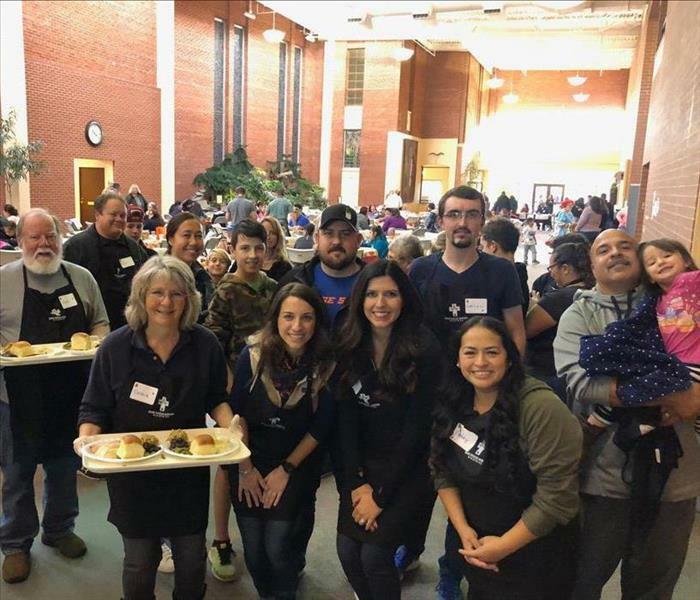 Our team had a wonderful time serving members of the community at the Boise Rescue Mission Ministries 2018 Thanksgiving Banquet! Winder Buchanan and Blaine Tewell had the opportunity to attend the Farmers Insurance 2018 Mountain West Territory Agent Conference last week in Las Vegas, NV. We were accompanied by Joy Geraci, Business Development for three SERVPRO franchises in Utah. We had the ability to be a sponsor during their hospitality reception and give a brief commercial promoting our company and why Farmers Insurance agents should call us! SERVPRO was proud to sponsor the Local 4716 Star Firefighters at the 40th Annual Pheasant Hunters Breakfast. 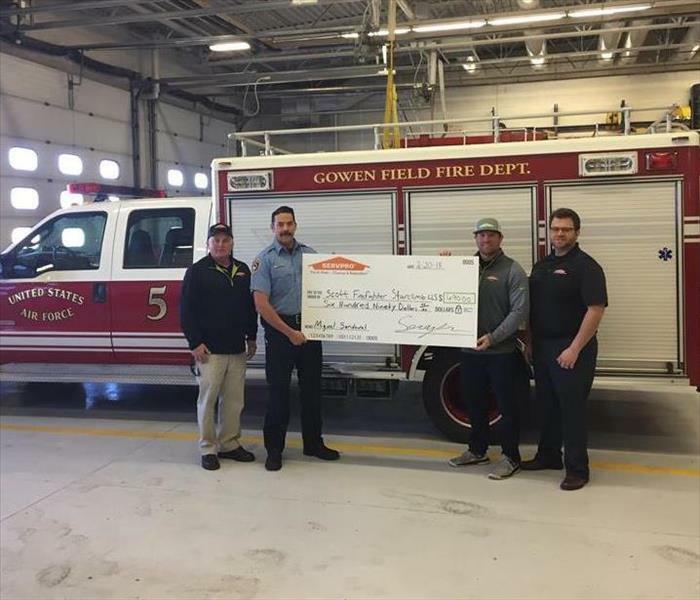 The funds raised went to help the burnout fund for the fire district and for equipment and training expenses. Two of our Sales & Marketing Representatives recently attended the National Association of Residential Property Managers (NARPM) Vendor Fair. They had a wonderful time networking with local property managers and staff. Also, congratulations to Courtney Wolfe who won our raffle drawing! Our very own Blaine Tewell attended the Idaho Volunteer Fire & Emergecy Services Association's Fall Conference last weekend. The 2018 Fire Academy was held September 21st-23rd and hosted over 150 students. Our team sponsored the 9-11 Never Forget Golf Tournament at Eagle Hills Golf Course. 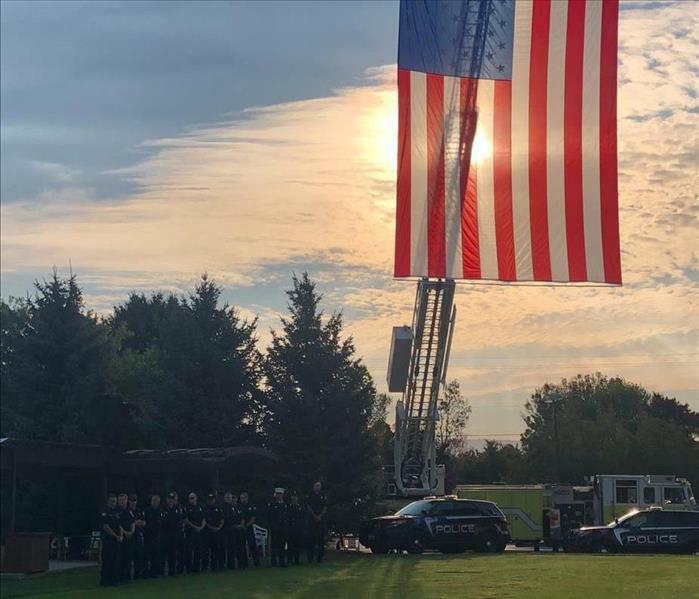 This tournament is held in honor and memory of the Fire Fighters, Police Officers, and EMS personnel who died during service on September 11th, 2001. United We Stand on this 17th anniversary of 9/11. 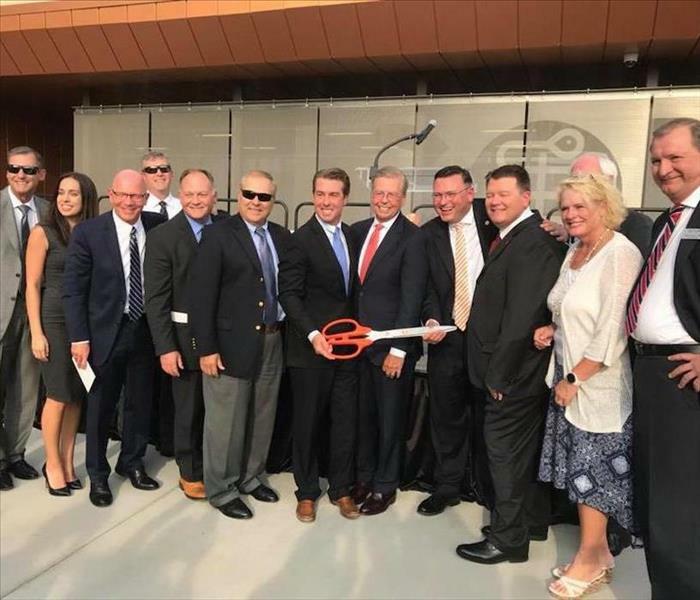 We had a wonderful time attending the Idaho College of Osteopathic Medicine- ICOM ribbon cutting and open house last night! What an exciting time for the Treasure Valley, welcoming 162 medical students to the first medical school in Idaho. Thank you to the Meridian Chamber of Commerce for hosting the Quarterly Networking & Vendor Luncheon presented by: Blue Cross of Idaho and Wahooz Family Fun Zone. 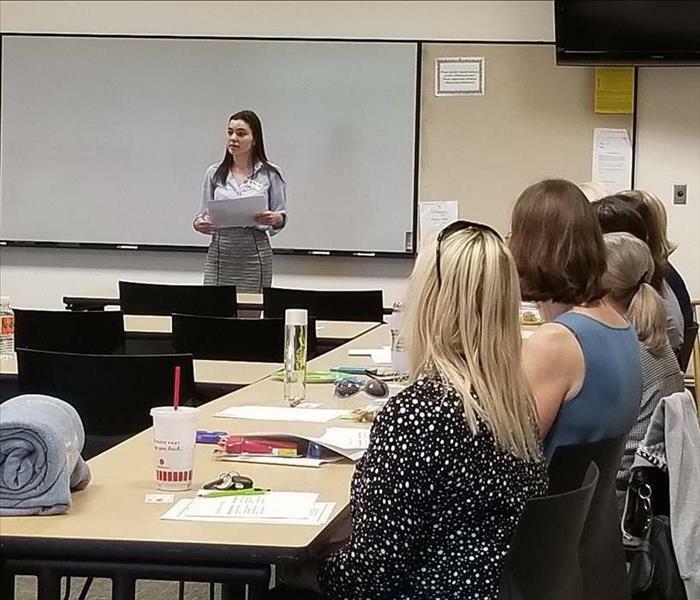 Our Marketing Support Coordinator: Kaitlin Hummel did an awesome job representing our company and networking with local Meridian business professionals. 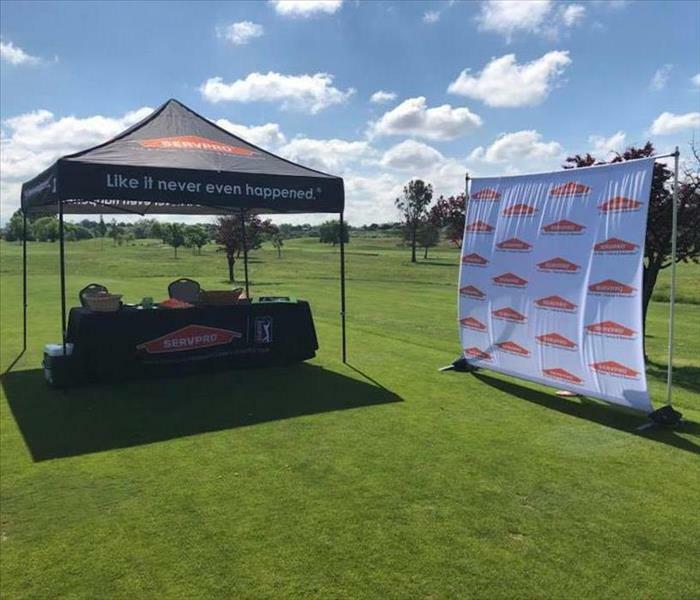 A huge thank you to the MPEA- Meridian Police Employee Association for putting on a wonderful golf tournament and to Idaho Select Insurance, LLC for representing SERVPRO on the course. 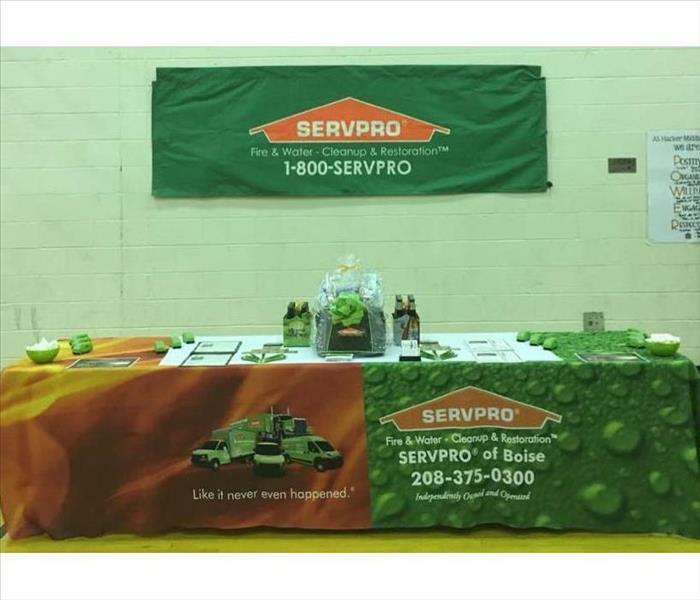 SERVPRO is always proud to sponsor and support fundraisers for fallen/injured first responders. 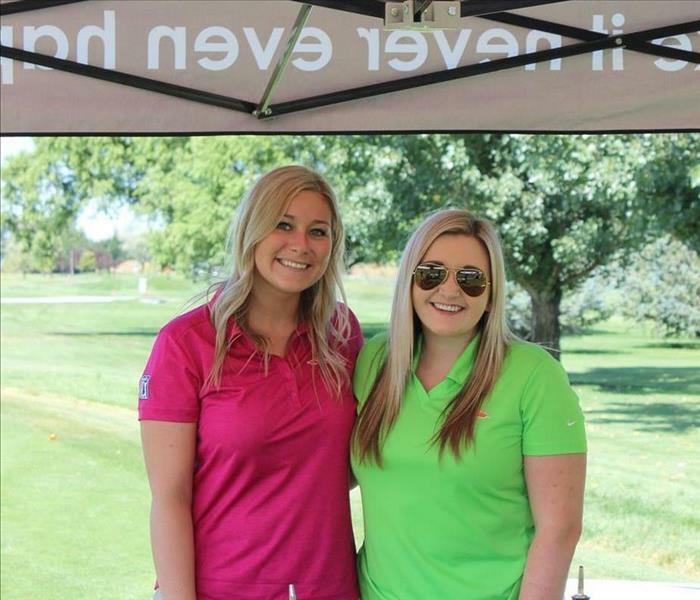 Jordyn Funk and Kaitlin Hummel representing SERVPRO at the Boise Metro Chamber Golf Classic in August. We had a wonderful day networking and golfing with other business professionals in the Treasure Valley. The Kuna Fire Dist. hosted their 20th Annual BBQ Fundraiser on Saturday. This year was extra special because the BBQ focused on Community Education. They had a live vehicle extrication demo and tons of kid friendly events and games. We are thankful to have been a sponsor of such a wonderful event, we look forward to participating again next year! Our very own Beth Byce and Blaine Tewell were the guest speakers at the July Trauma Intervention Program continuing education meeting. They presented on bio-hazard/trauma cleanup and answered many questions on processes, safety and pricing. 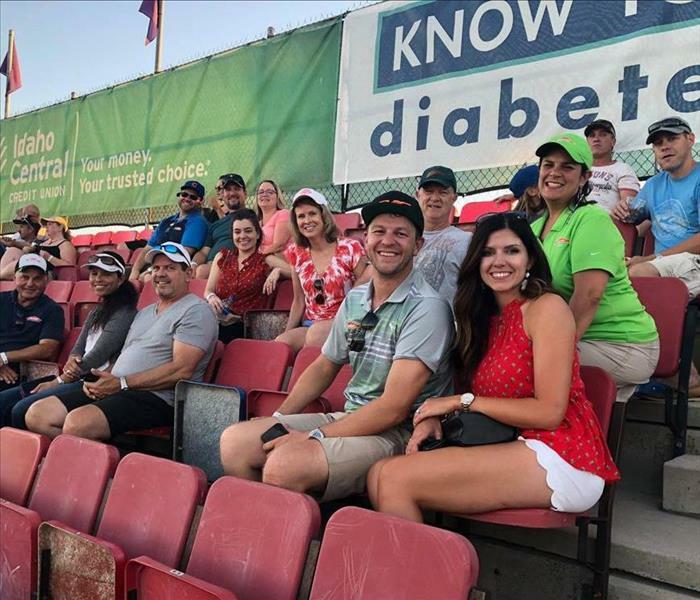 We had a wonderful night at the Boise Hawks game last Thursday! Thank you to everyone who made it possible and all of our clients that attended, we greatly appreciate your friendship and business. 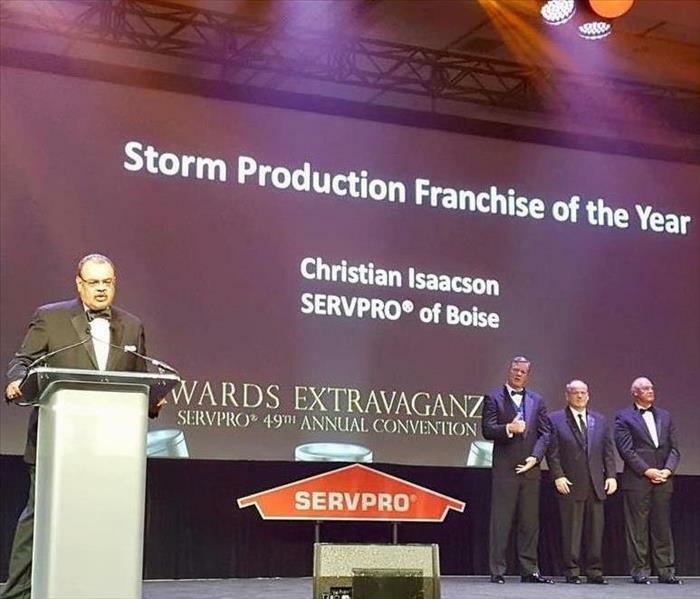 This past week the SERVPRO of Boise team and our leader Christian Isaacson were honored to receive two outstanding awards at the 49th Annual SERVPRO Convention in Florida. We are humbled and grateful to receive the Storm Production Franchise of the Year as well as an award for being 42nd in a franchise system of 1,700+ franchises. None of this could be possible without our team who dedicates their lives to helping people of the Treasure Valley and beyond. Thank you for allowing SERVPRO to be your first choice for disaster recovery! We had an absolute blast sponsoring the IREM - Boise, Snake River Chapter #107 & CCIM Institute 2018 8th Annual Give Back Golf Tournament. We had a wonderful day networking and golfing all while supporting Camp Rainbow Gold, Inc.! 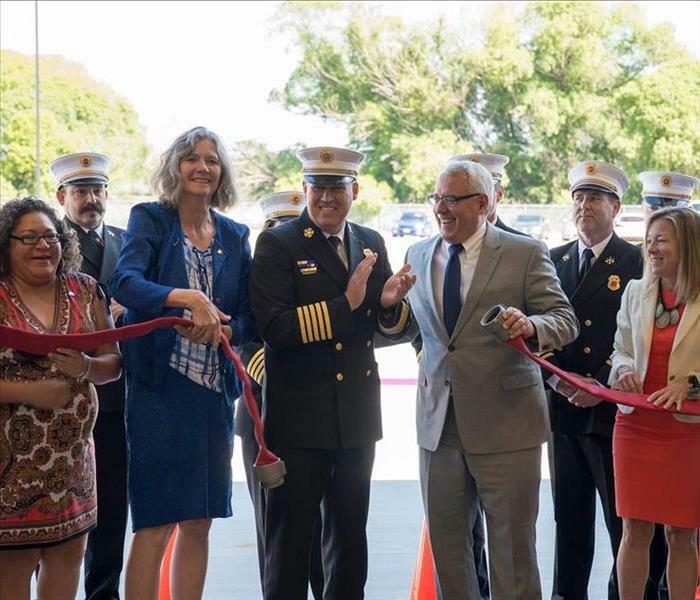 Our team had a wonderful time attending the Boise Fire Department Training Center Grand Opening! Congratulations to everyone who made it possible and all the individuals who worked tirelessly on this project. It will without a doubt make a difference in our community! SERVPRO joined Make-A-Wish supporters in our community for this year’s Walk For Wishes. Our team helped raise money to grant wishes for children with critical illnesses in our community. We must be getting good at this whole golf tournament thing! 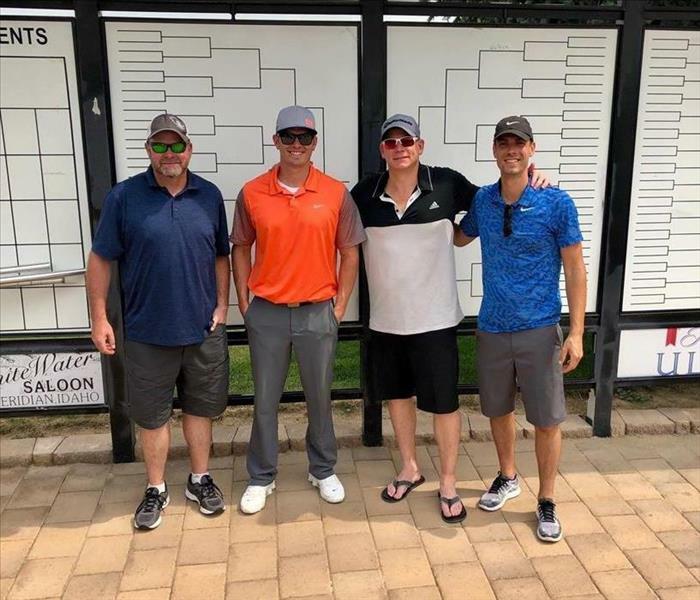 Thank you to the Meridian Chamber of Commerce, the Boise Adjusters Association and Boise State University for putting on wonderful tournaments this spring! We are grateful to have been sponsors. The Better Business Bureau stopped by our office this week to spotlight our franchise. We are proud to be a BBB Accredited Business since 2006, upholding the 8 Standards of Trust. Thank you for helping members of our community find local companies they can trust. We appreciate all you do for the Treasure Valley! Our team attended the Boise Metro Chamber Small Business of the Year & Chamber Excellence Awards Luncheon this week. 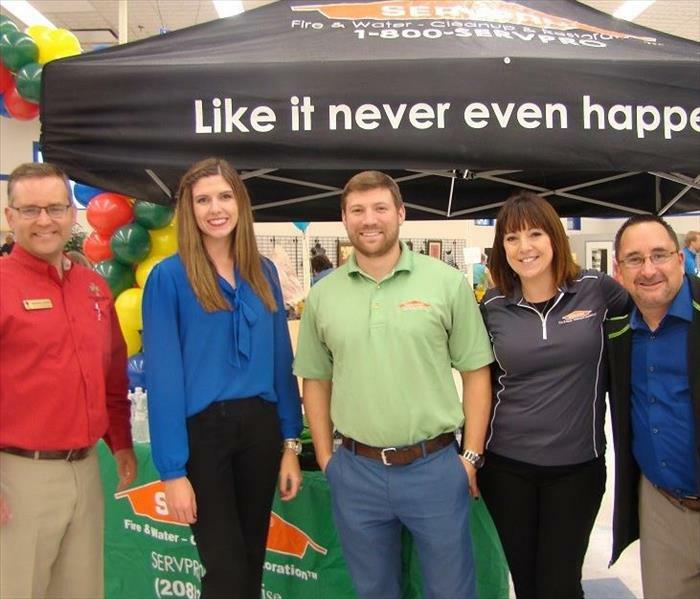 SERVPRO was recognized within the Treasure Valley for excellent performance in the small business industry. Congratulations to all of the finalists and award winners! 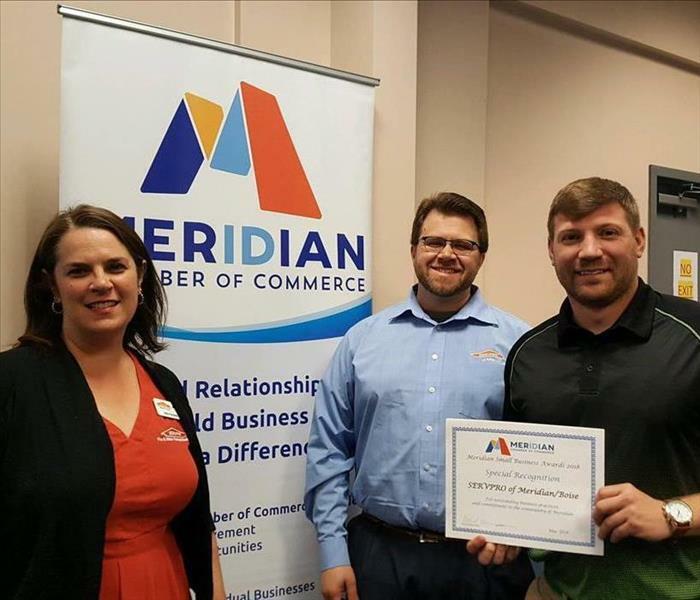 Our team attend the Meridian Chamber of Commerce 2018 Business Awards Luncheon this week. 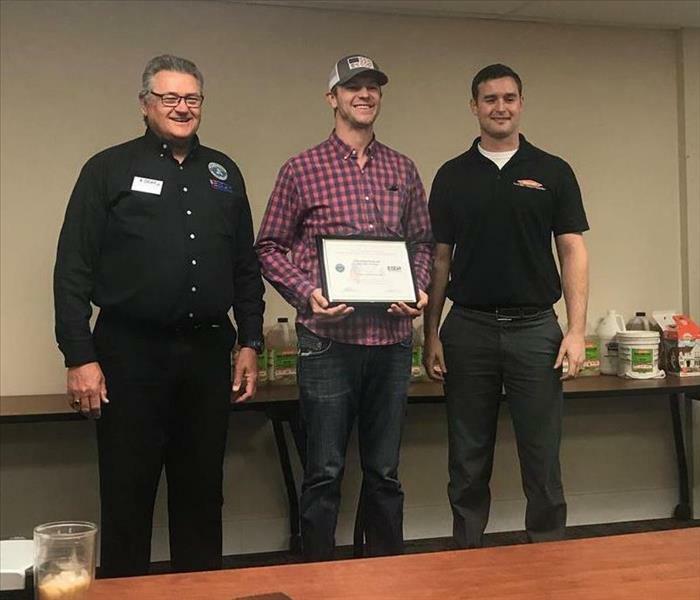 SERVPRO and our leader Christian Isaacson were recognized for outstanding business practices, and commitment to the community of Meridian. Congratulations to all of the nominees and award winners! 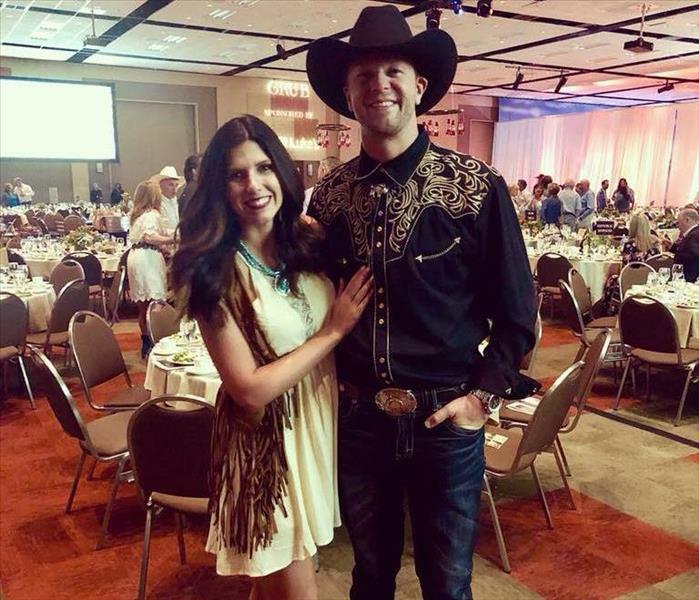 Our fearless leaders attended the Wild West Auction for Kids at the Boise Centre. 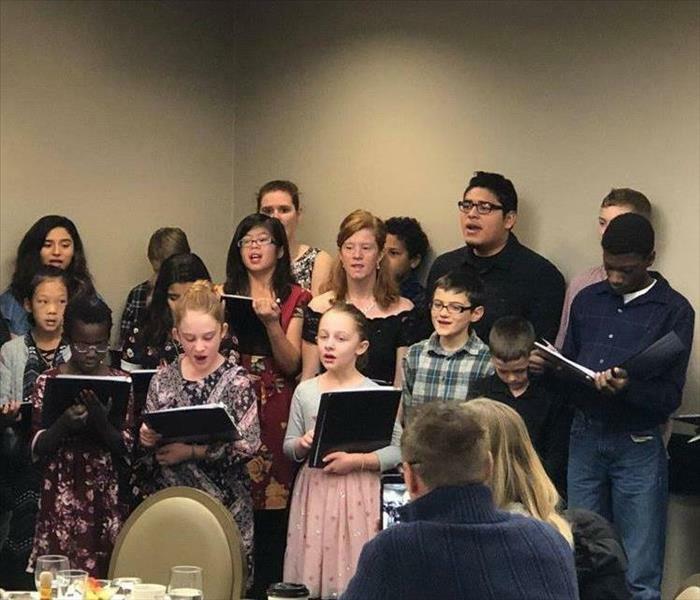 This event is held each spring and is one of the Treasure Valley’s premier events that raises critical operating funds for the Boys & Girls Clubs of Ada County. 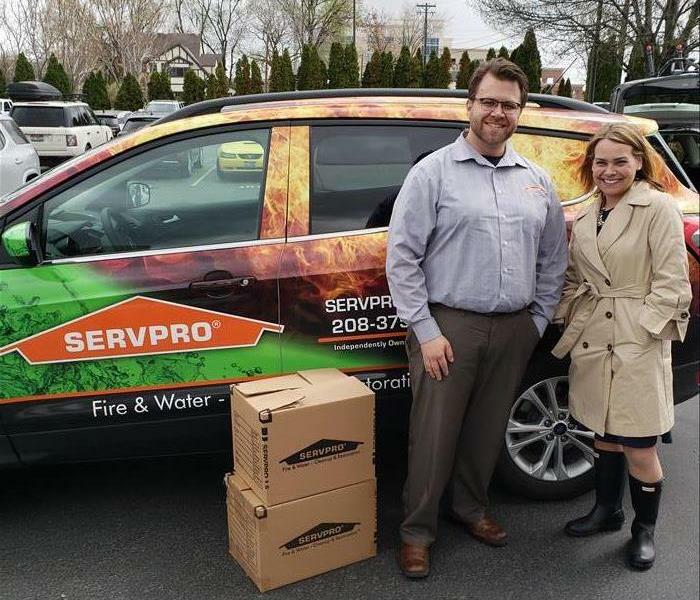 On April 27-28th SERVPRO teamed up with the American Red Cross, fire departments, and volunteers to Sound the Alarm with home fire safety and smoke alarm installation events. 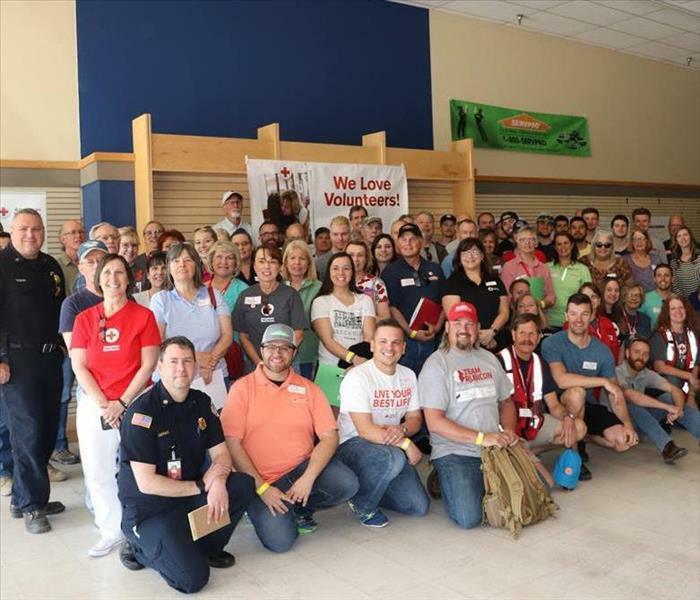 We helped install 1,000 free smoke alarms in more than 500 at-risk homes in the Treasure Valley. 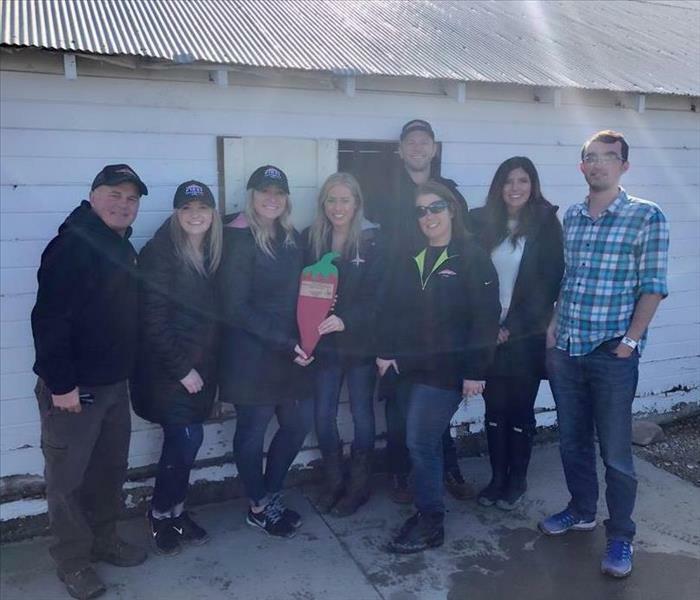 SERVPRO of Boise teamed up with the United Way of Treasure Valley and Thornton Oliver Keller Commercial Real Estate to collect new and gently used children's books. The week-long event is designed to inspire and unite Idahoans in the spirit of helping low-income children achieve reading competencies that will lead to lifelong success! 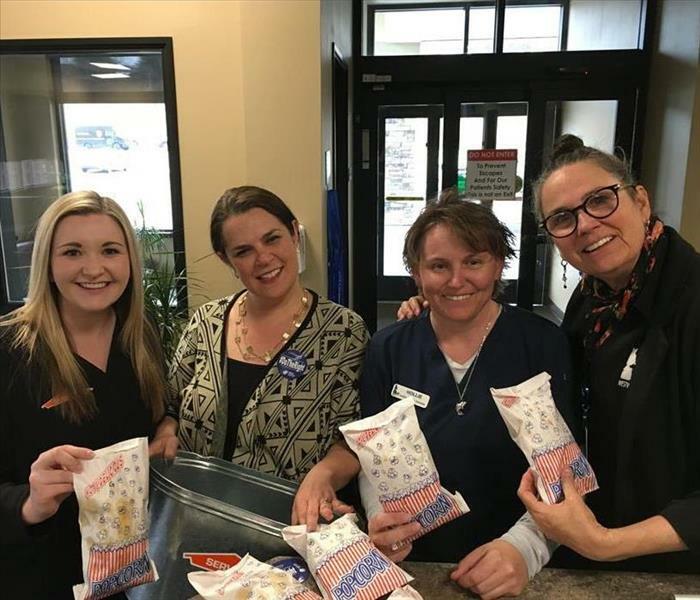 Our marketing team had so much fun popping in to see our neighbors on Do The Right Day. We stopped by WestVet, Better Business Bureau, Garden City Police Department, Wood Windows Inc., and Idaho Wine Merchant. Do The Right is a day to start a movement of compassion by encouraging everyone to do something kind for the person to their right- neighbors, family members, coworkers, or classmates. 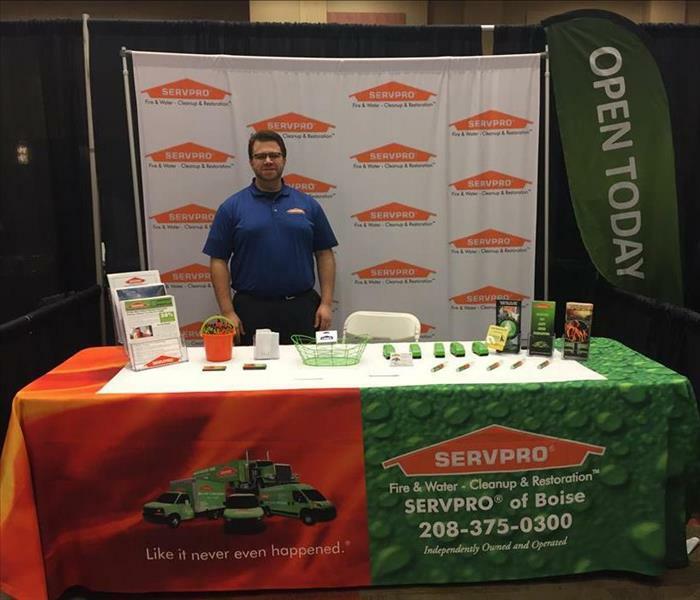 Luke McManamon represented SERVPRO at the Idaho Housing & Economic Development Conference this week. Participating in this conference gave individuals unlimited access to resources, tools, solutions and most importantly connections to professionals within the industry. 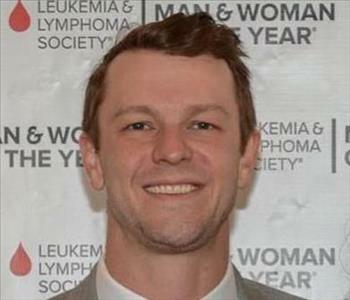 SERVPRO is proud to support an amazing organization, to raise funds for the Leukemia & Lymphoma Society. Good luck to all the fire fighters participating in the Scott Firefighter Stairclimb in Seattle on March 11th! 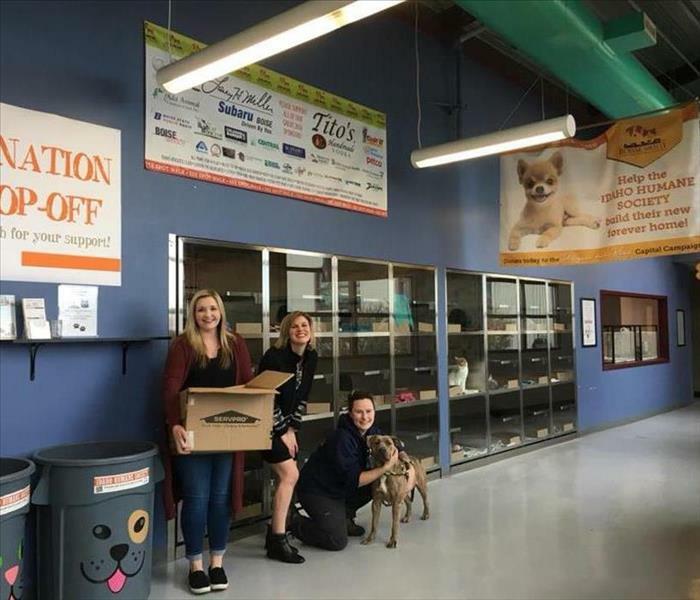 SERVPRO donated over thirty tubs of peanut butter to the Idaho Humane Society to help aid in the process of giving the shelter animals their medication. What did you do for Random Acts of Kindness Day? 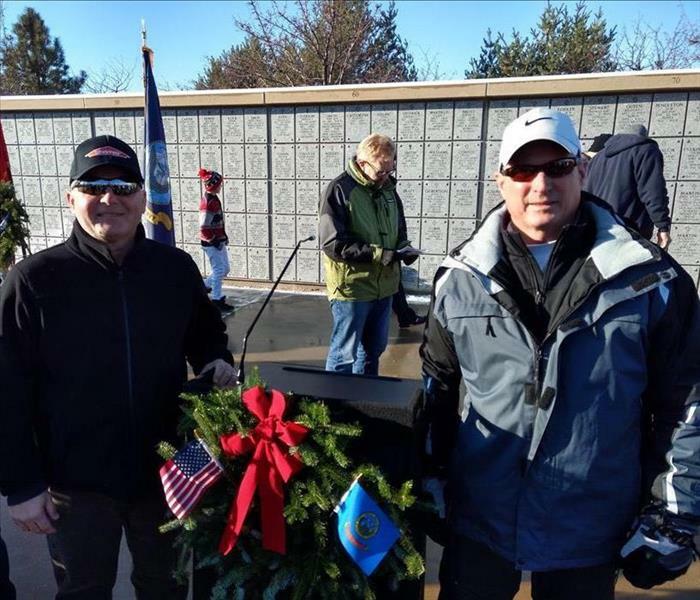 Our Sales & Marketing Representative Blaine Tewell spent an early December morning laying wreaths in honor of every veteran laid to rest at the Idaho State Veterans Cemetery in Boise. The organizations mission is to remember, honor and teach. 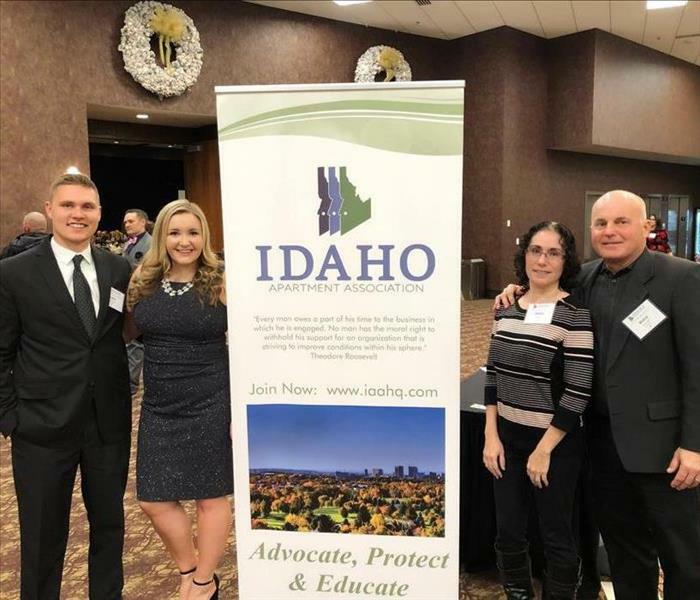 Kaitlin Hummel and Blaine Tewell from our marketing team had a blast at the Idaho Apartment Association Awards last winter! They enjoyed watching their clients be recognized for their efforts in the community, don't they clean up nicely? 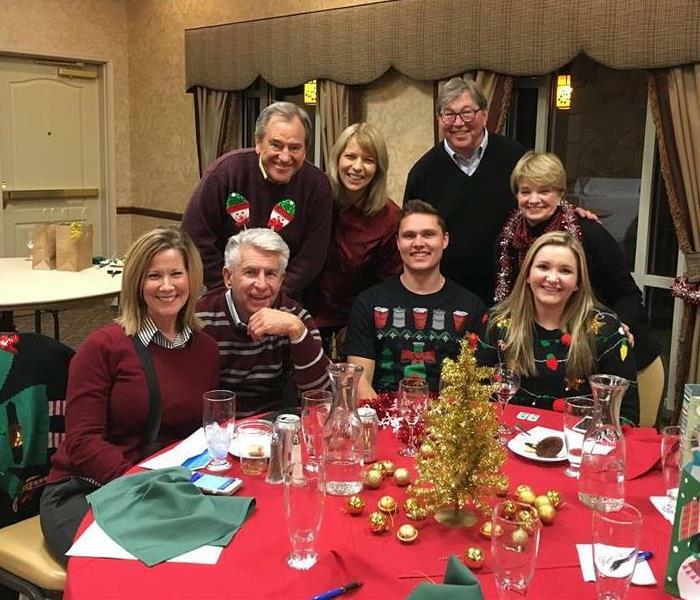 Kaitlin Hummel our Marketing Support Coordinator had a blast at the Eagle Chamber of Commerce holiday party. SERVPRO loves the Chamber and the holidays! Thank you for putting on such a wonderful event each and every year. 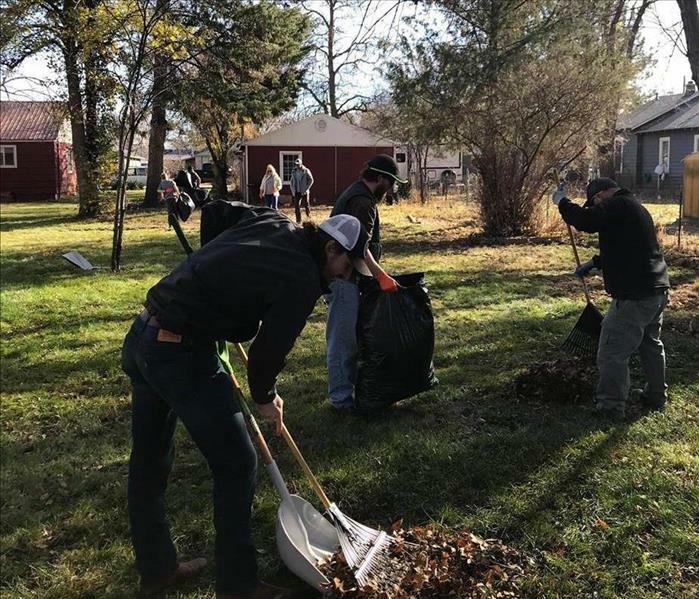 Our team had a great time participating in Rake Up Boise, we can't wait to help out again next year! We love the Treasure Valley and enjoy giving back to the community we work and play in. The results are in! 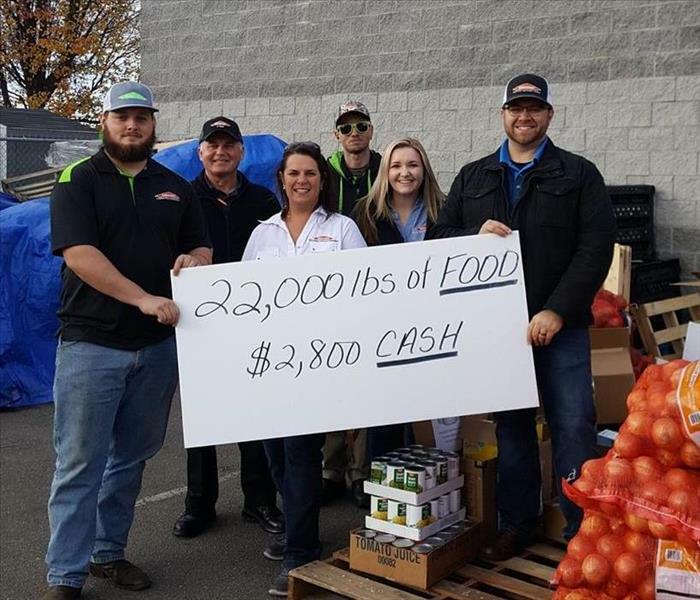 SERVPRO was able to help donate 20,000 lbs. of food to the Boise Rescue Mission Ministries. Thank you to all of the Treasure Valley businesses that participated and a huge thank you to Dawn Adams with Farmers Insurance for putting this even on every year! 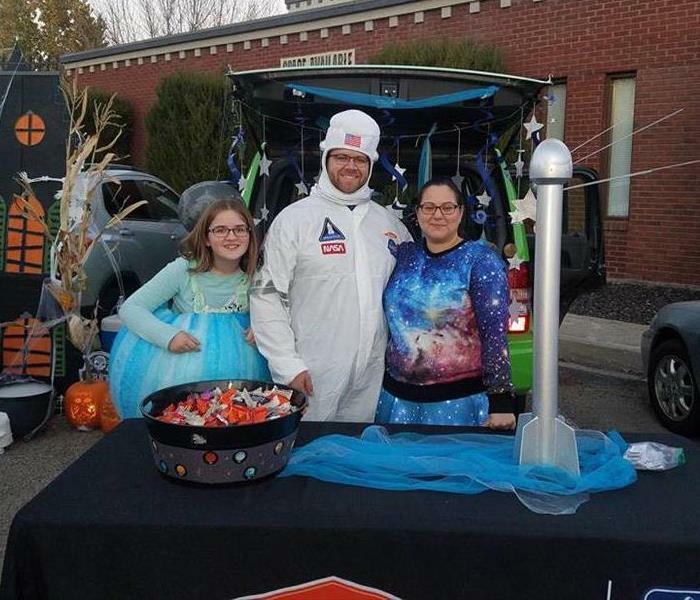 Our very own Luke McManamon and his family rocked the Meridian Trunk or Treat! Check out their awesome space themed booth and costumes. We love participating in this event each and every year! 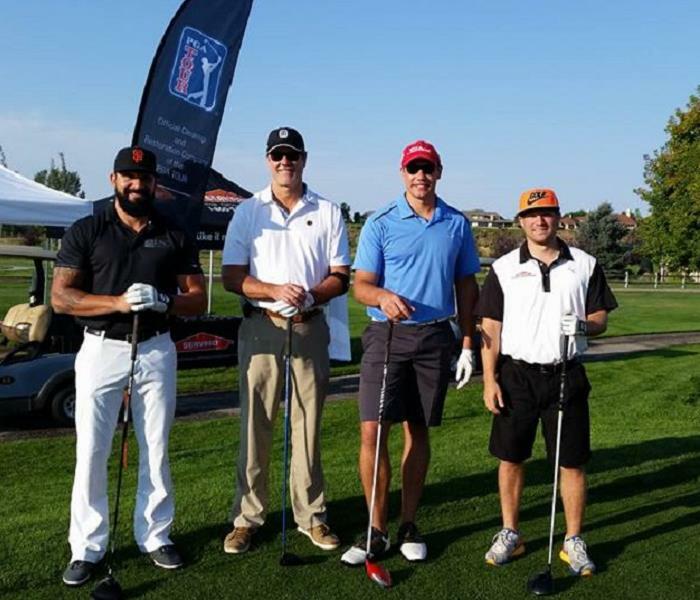 The Boise Metro Chamber of Commerce annual golf tournament was held at The Club at SpurWing last August. It is always one of our favorites, thanks for another great year! 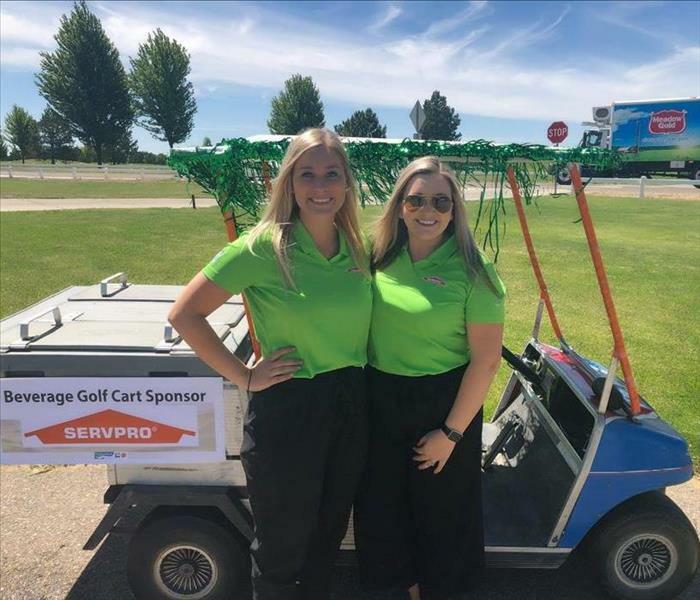 Our team members Kelly Parziale and Ashley Jacobs-Spainhower were hard at work handing out refreshments and SERVPRO goodies at this year's Boise Adjuster's Association Golf Tournament. 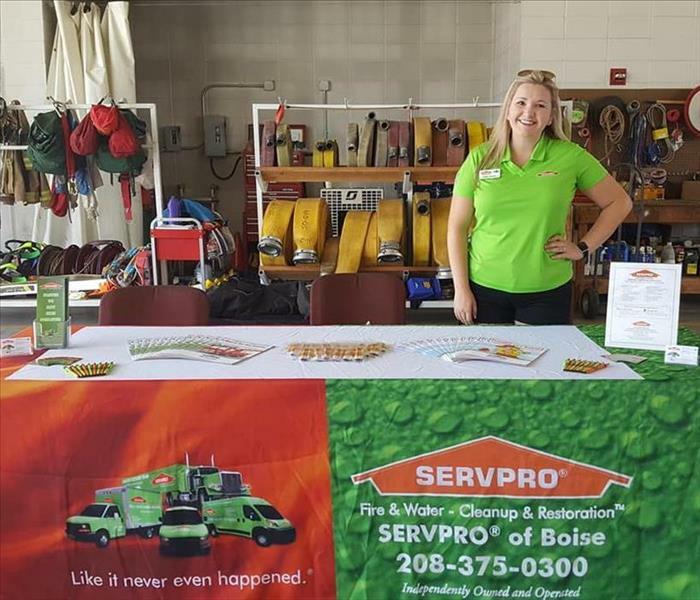 The Boise Adjuster's Association supports many local non-profits and SERVPRO is happy to be able to join forces with this great organization! 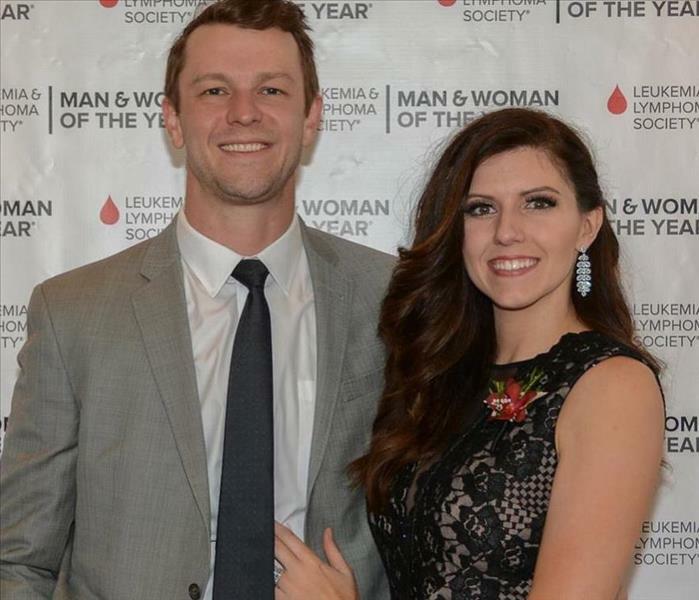 One of our owners, Allie Isaacson, was nominated to raise funds for the local chapter of the Leukemia Lymphoma Society over a 10-week campaign. She took this challenge head-on and raised over $15,000 in that short amount of time. 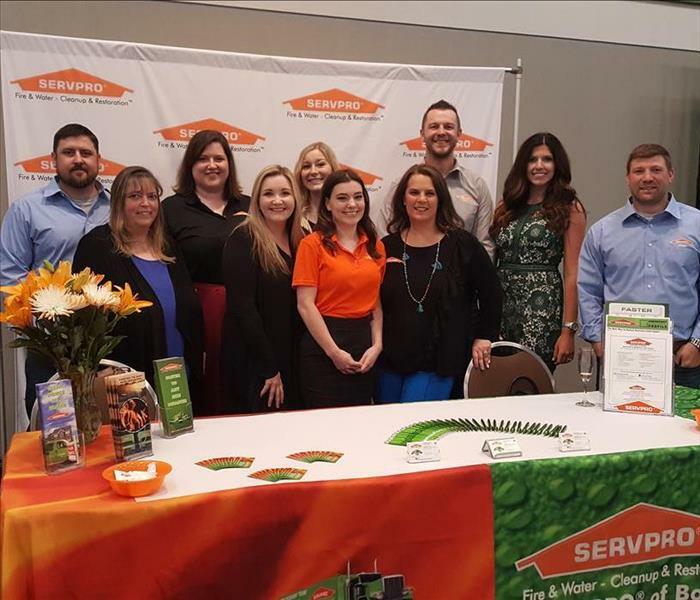 SERVPRO was proud to be a sponsor of the Man & Woman of the Year event which raised over $308,000 to help cancer patients nationwide! Congratulations to our leader Chris Isaacson for receiving a Patriot Award Today from the E.S.G.R. (employer support of the guard and reserve). The Patriot Award reflects the efforts made to support citizen warriors through a wide-range of measures including flexible schedules, time off prior to and after deployment, caring for families, and granting leaves of absence if needed. We are proud of Chris for living and breathing his patriotic values. Chris supports our very own National Guard Black Hawk Pilot, Kyle Sam. Congratulations Chris! 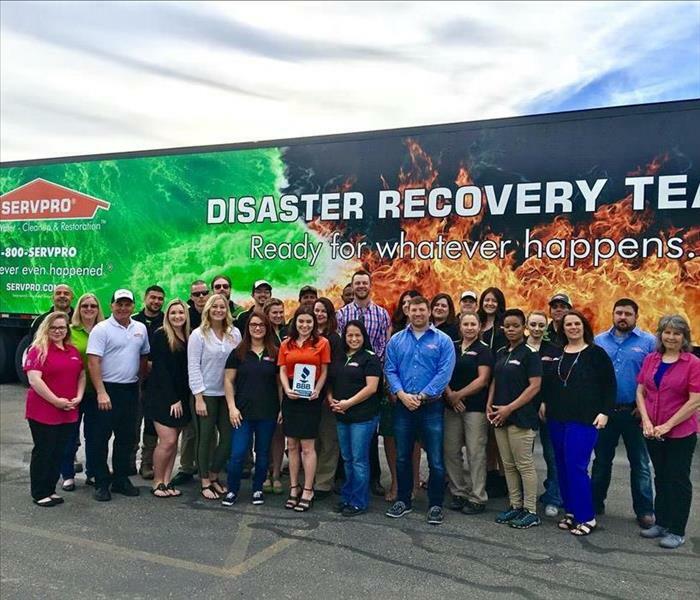 SERVPRO and the Red Cross partner together to help those affected by disasters nationwide. 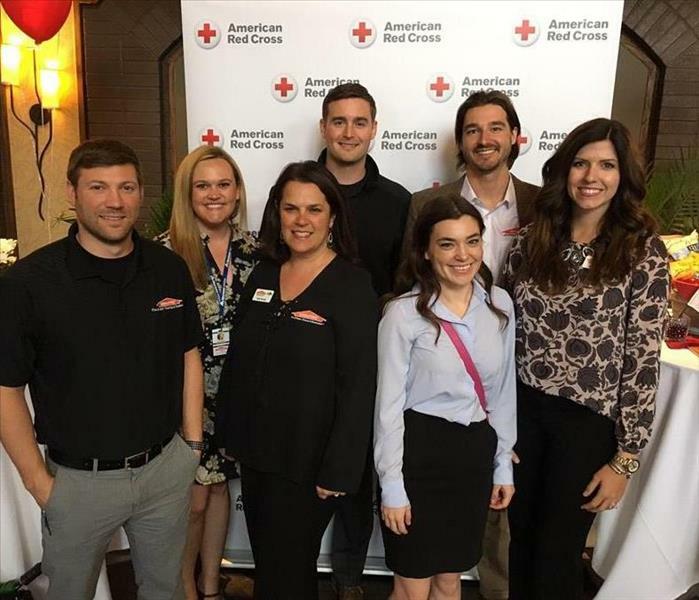 Our team had the pleasure of sponsoring and attending the local Red Cross of Idaho's Hometown Heroes Banquet. This is one of our favorite events every year, the stories of our local heroes always touch our hearts and inspire us to give back to our community! The Red Cross of Idaho raised over $7,000 to assist local residents in their time of need. 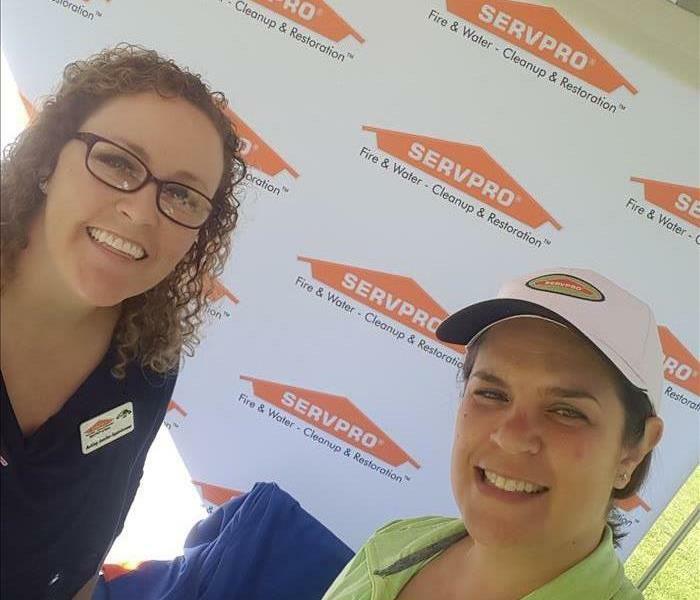 SERVPRO is proud to support our local Red Cross chapter! Our marketing team worked hard to fill sandbags on the National Day of Volunteering. These sandbags are being used to help prevent erosion of the Boise River throughout the valley! We can't wait to volunteer for our community again soon! SERVPRO of Boise supported the opening of the new Boise Rescue Mission Thrift Store. Our Marketing Manager, Winder Buchanan, presented one of the awards at the 2016 Hometown Heroes Awards Luncheon! 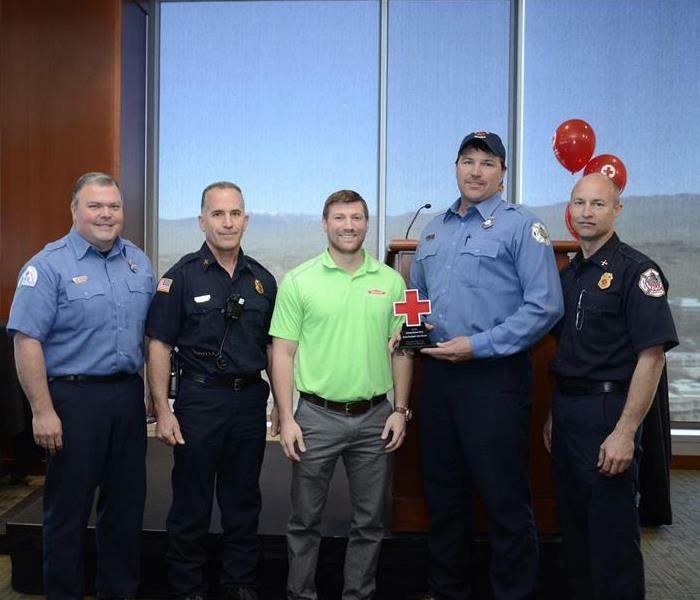 SERVPRO of Boise also helped sponsor the event and is proud to partner with the American Red Cross! 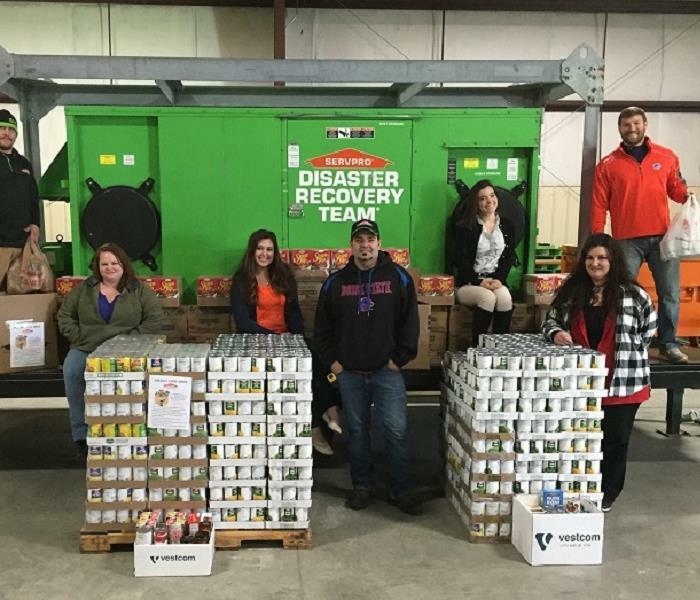 SERVPRO of Boise was happy to donate once again to the Boise Rescue Mission's annual winter food drive! 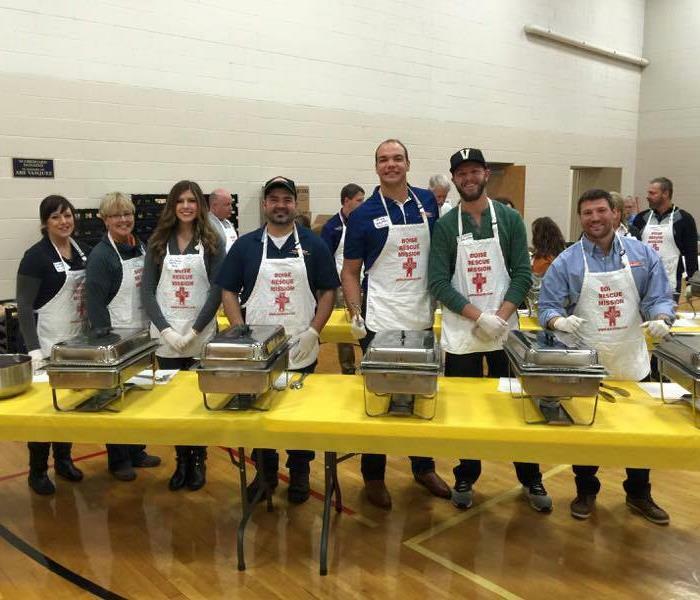 The SERVPRO of Boise team enjoyed serving dinner at the 2015 Great Thanksgiving Banquet hosted by the Boise Rescue Mission! 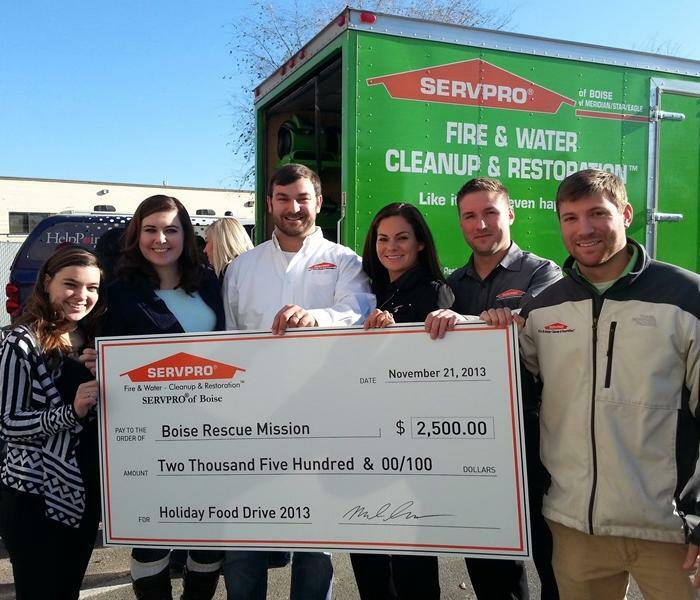 SERVPRO is proud to support the Boise Rescue Mission! 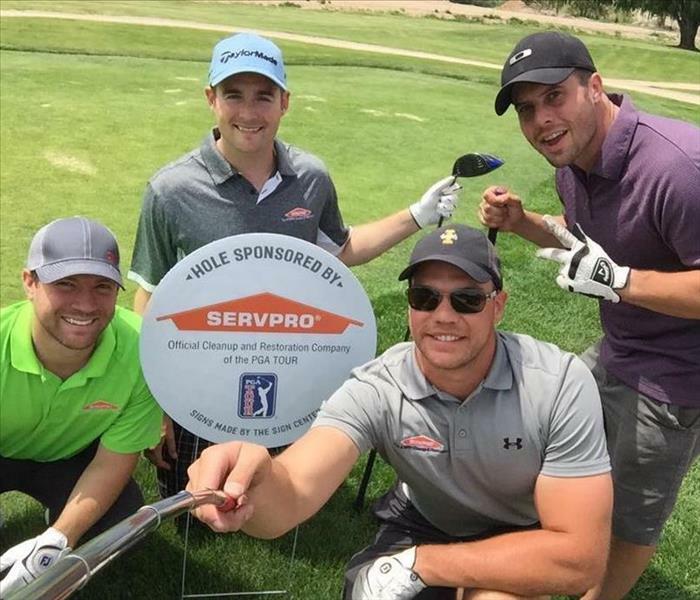 The SERVPRO of Boise Team had fun playing in the 2015 Boise Metro Chamber of Commerce golf tournament at SpurWing Greens in Meridian! 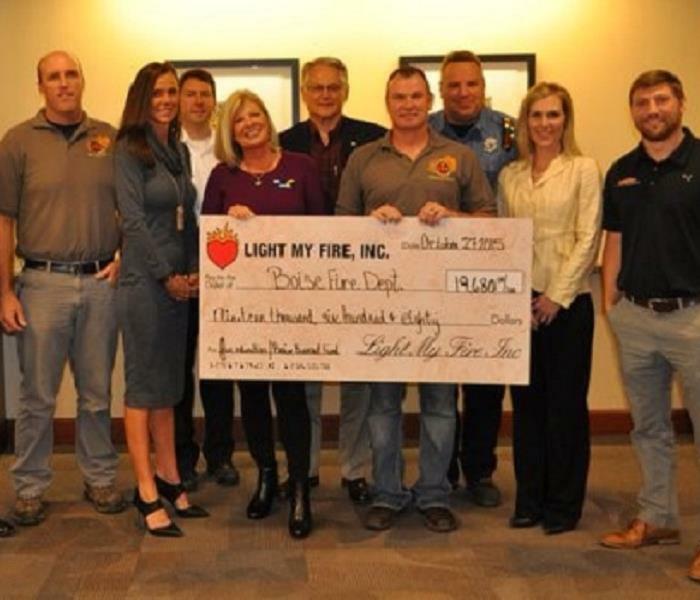 Our Marketing Manager, Winder Buchanan, helped present the check to the Boise Fire Department for the Boise Burnout Fund for almost $20,000!! 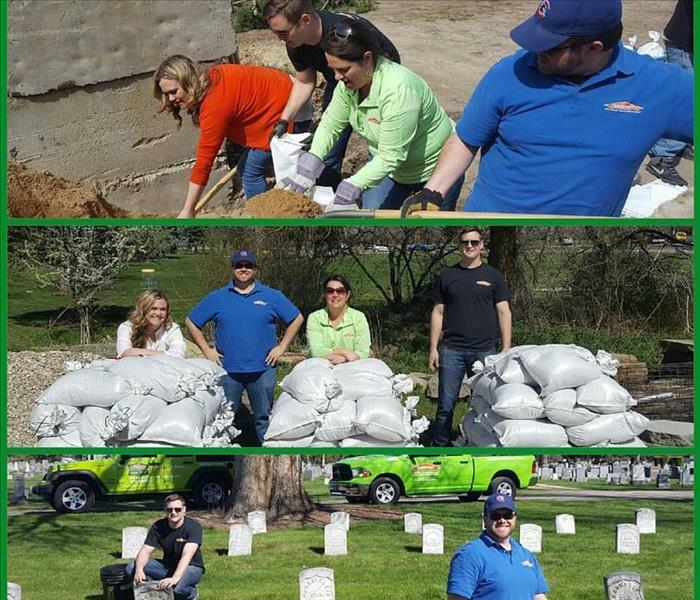 SERVPRO of Boise was proud to contribute to this great community fund! 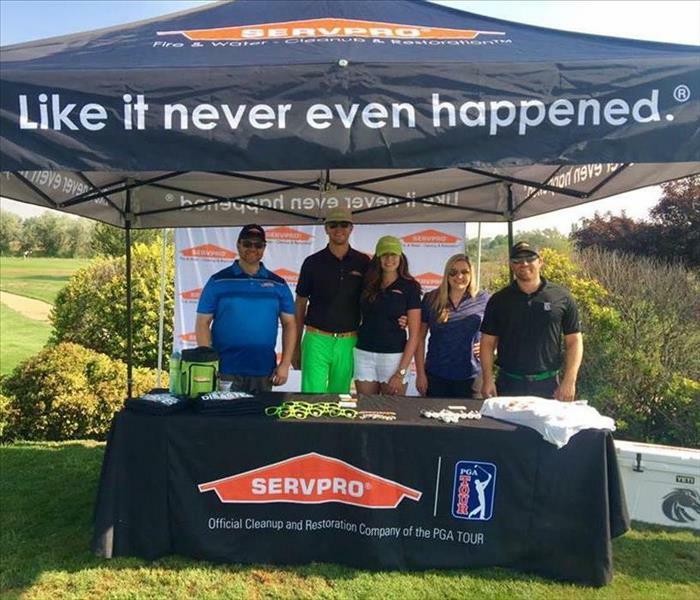 SERVPRO of Boise was happy to sponsor and participate in the 208 Gives Back Golf Tournament in 2016. 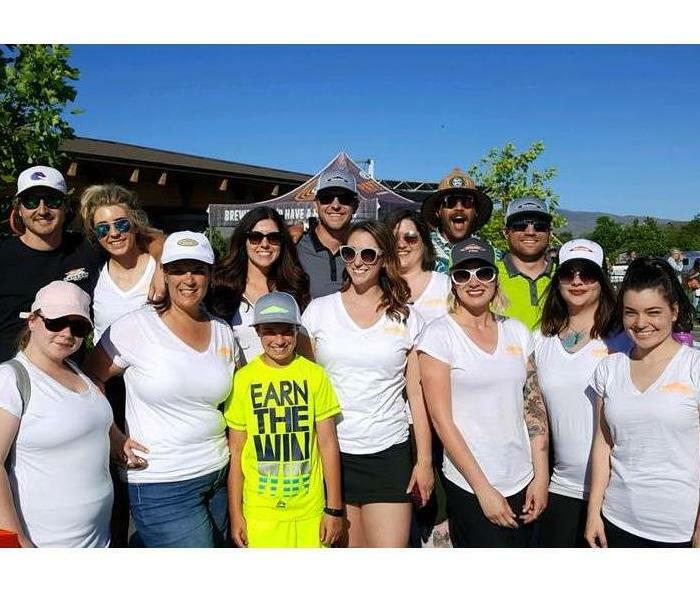 We sponsored this event to support the Boise Burnout Fund. This wonderful charity does so much to help families who are displaced by fire, and often times have lost everything. Have you ever wondered where those families go when everything they have is lost? The Boise Burnout Fund helps with cash support for immediate housing and other necessary accommodations. The team at SERVPRO of Boise contributed to the 2013 Food Drive to benefit the Boise Rescue Mission. Franchise Owner, Michael Isaacson (center) is surrounded by his Office and Marketing teams.